Turkish police have arrested a suspected suicide bomber who threatened to detonate a bomb near the US Consulate General in Istanbul, according to local media. 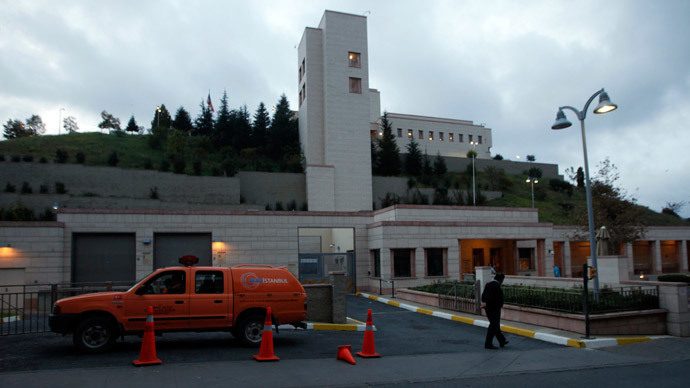 The police received a tipoff that the suspect had parked his vehicle, containing explosives, near the US Consulate General in the Sarıyer district of Istanbul. The attacker, described as a man in his thirties, shouted that he would detonate the bomb. Turkey’s Dogan News Agency reported that he claimed there were explosives in his vehicle. Turkish special forces managed to apprehend the man, according to the Hurriyet Daily News, who was described as being mentally ill. He was taken for medical treatment. Initial reports said that he was not carrying a bomb. Photos and videos claiming to show the would-be suicide bomber have been posted on social media. They depict a man wearing a black jacket with his hand in his pocket. Following the incident, Turkish police sealed off the street near the consulate, a witness told Reuters. Earlier, a US diplomat said that the consulate had taken all necessary precautionary measures after the alert. In January, a suicide bomber attacked a police station in Istanbul’s tourist Sultanahmet district, leaving one officer dead and one injured.